It doesn’t matter what time of year, or what the thermostat reads- if you put a bowl of soup in front of my, I’m gonna dig right in. Not just your average tuck in and eat either. I’m gonna dive in, spoon first, and enjoy every single mouthful. I seriously love soup. I heart soup. Soup is one of my favorite things ever, to make & to savor. Some people think soup’s boring or bland, because all they’ve had are simple soups. Sometimes simple can be best. For example, our Crockpot Ham & White Bean Soup is about as simple as it gets. I guarantee ya though that it’ll ‘bowl’ you over with flavor. Other times, you want a soup that’s complex with a beautiful blend of perfectly paired ingredients, flavors, and seasonings. Even when making a heartier soup, it’s really hard to truly go wrong. It’s the perfect thing to experiment with for the budding cook. The possibilities are darn near limitless. Although I do find different combinations, or ingredients. to be more ‘appropriate’ for my pallet and my hunger level depending on the season. Stews & chowders I tend to leave off for the colder months. Stew tends to apply to any soup that’s thick & hearty, but from being chock full of ingredients as opposed to thick from cream. Chowders on the other hand are also thick, with plenty of delicious ingredients, but the thickness itself comes from a dense, cream-infused broth base. In the Summer, I still love a good bowl of fresh soup- BUT I tend to stick to actual soup. 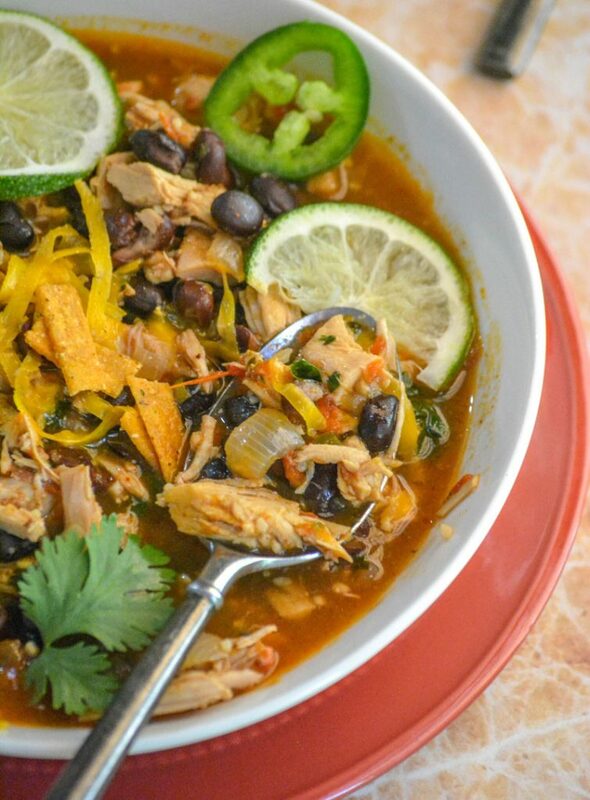 This Healthy Chicken & Black Bean Tex Mex Soup being a real family favorite. 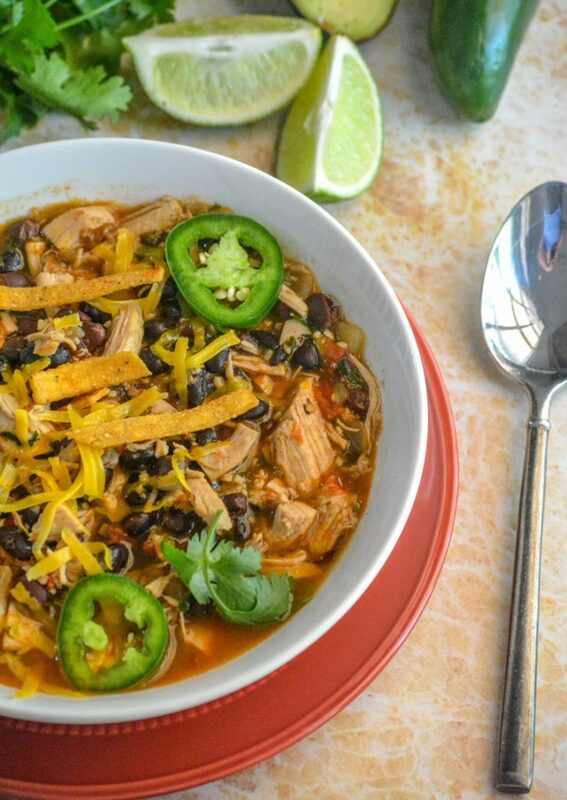 Less than 10 ingredients come together to make this magical Tex Mex soup. It’s packed with protein & fiber, making it low cal and healthy- as long as you exercise some portion control. 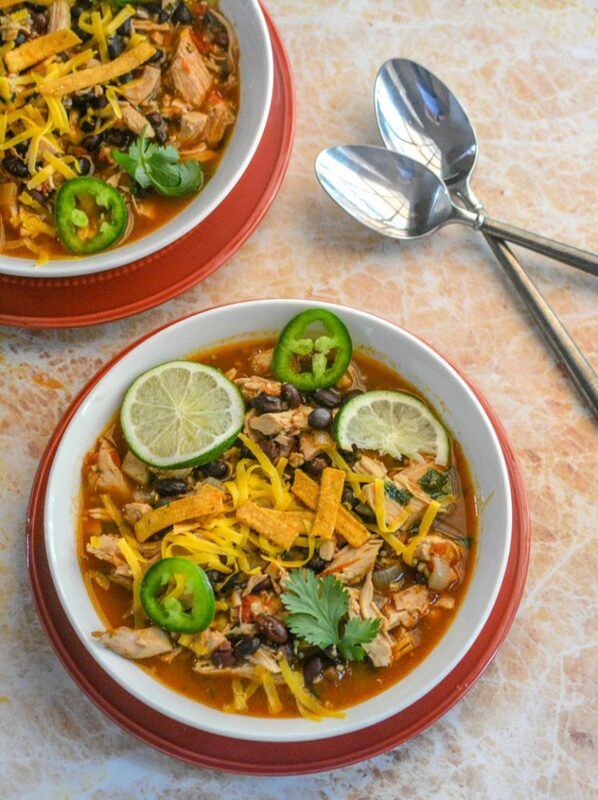 It’s also the perfect base soup to load up with as many of your favorite garnishes as you can handle. We love fresh lime/juice, crispy tortilla strips, shredded cheddar, sliced jalapeno, and cilantro leaves in particular. Sour cream and chunks or slices of fresh avocado are also super yummy additions. 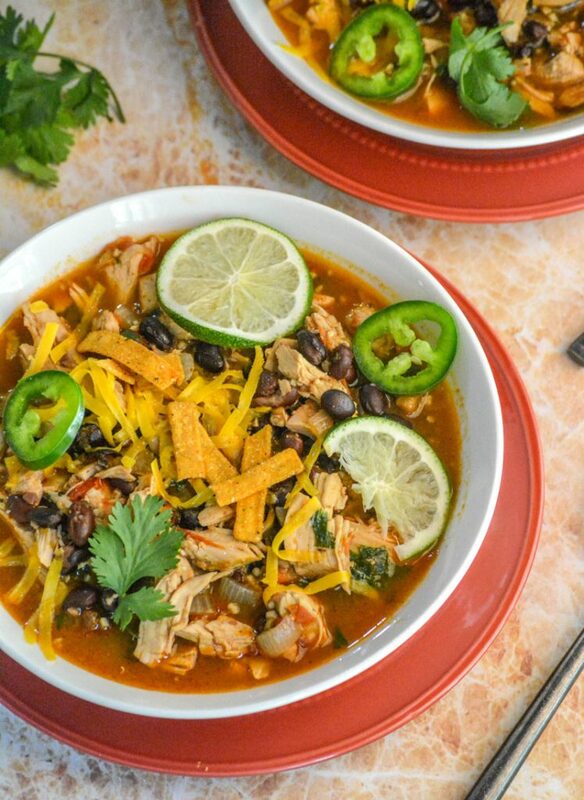 It’s a perfect Summer soup with a bit of ‘Mexican’ flair for lunch or dinner. Even better? 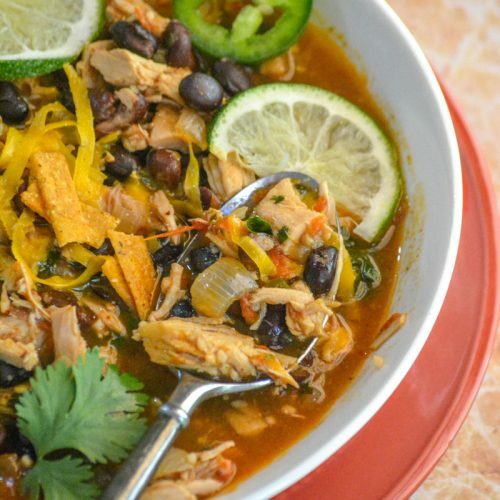 This Healthy Chicken & Black Bean Tex Mex Soup cooks all in one single pot. That equals less dishes for you, on top of a very full, happy, fit family. 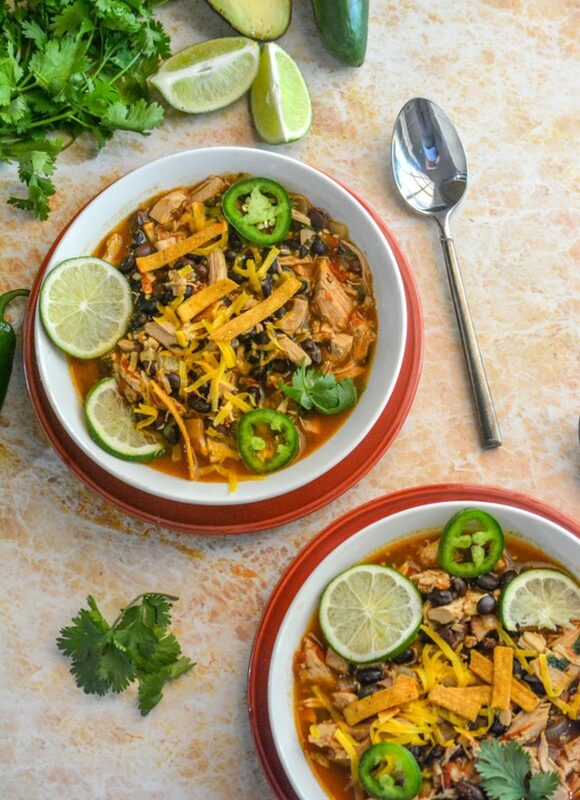 Other Summer soup ideas you might also enjoy: Copy Cat Taziki’s Greek Lemon Chicken Soup, Corn Off The Cob Soup, Barbecue Chicken Pizza Soup, & Thai Chicken Coconut Soup. 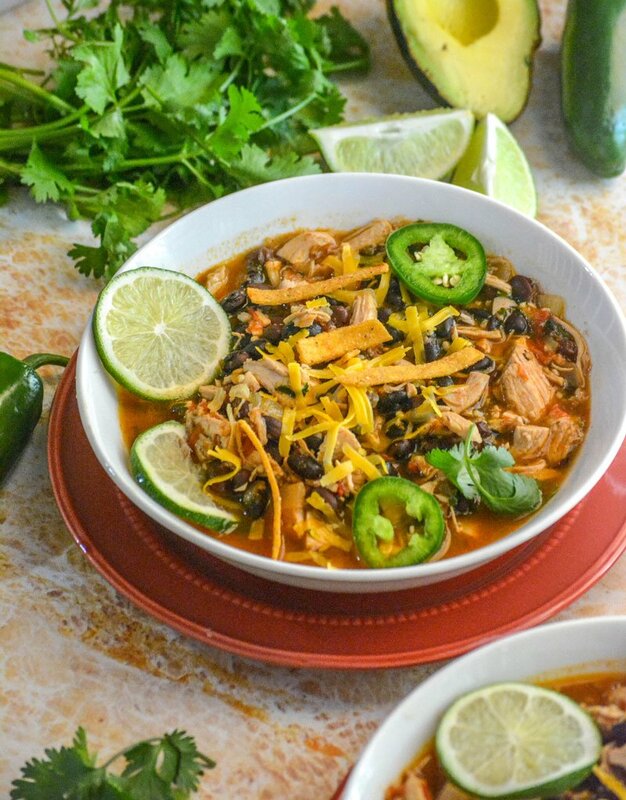 An easy, one pot Tex Mex soup, this healthy chicken & black bean version is hearty and loaded with protein and fiber without unnecessary extra carbs. In a dutch oven, or other large skillet, heat the olive oil. When hot, add in the onion, sauteing until tender and translucent. Stir in the garlic, cooking just until fragrant. Stir in the rest of the ingredients, except the cilantro, and bring to a rolling boil. Reduce the heat to medium low & cover, and stirring occasionally, let the mixture simmer for 15 minutes. Remove the pot from heat. Remove the lid, stir in the cilantro leaves, and salt & pepper the soup, to taste. Let the soup cool slightly while preparing your favorite garnishes. Serve while still warm! Ok Meaghan! I’m converted! No more will soup be confined to winter! This looks and sounds so delicious I’m wanting to eat it right now (it’s breakfast time)! Thanks so much for sharing at Fiesta Friday this week. This is simmering right now in preparation for dinner. Smell scrumptious for a Taco Tuesday Mexican meal. Thank you for sharing! i love this! So fresh and flavorful.